LEGO Set Build: Emmet & Lucy's Escape Buggy – AiPT! The set is right in the middle difficulty-wise, and works well for younger builders who need a challenge. 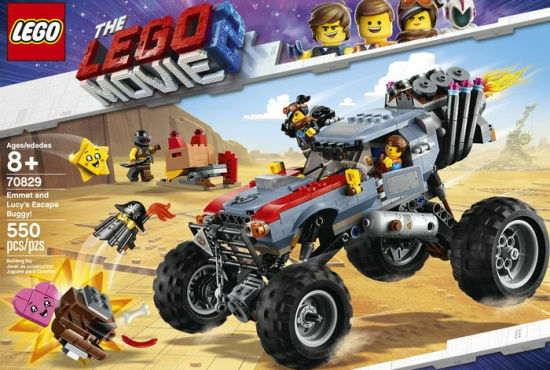 As The LEGO Movie 2 roars into theaters, it’s perfectly normal to see the tie-in sets make their way into stores. What is extraordinary about this film’s tie-ins is the magnitude and detail thrown into each. From the mid-level sets like “Battle-Ready Batman and Metalbeard” to the higher end “Rex’s Rexplorer” or “Welcome to Apocalypseburg,” these sets bring the movie to life. “Emmet & Lucy’s Escape Buggy” is a great example of this attention to detail for a reasonable price. My (not quite) nine-year-old and I set out to build this set one Saturday and it was one of the more time-consuming builds we have done in one sitting. “Attention span” is not my son’s middle name. Between the two of us, it took about 90 minutes from opening the package to completion. The set is right in the middle difficulty-wise, and works well for younger builders who need a challenge. From the get-go, the set is bigger than I expected (especially the bouncy rubber tires) and vibrant. The exhaust pipes pop with Wyldstyle’s flashy blue and pink colors. The haphazard, Mad Max-esque look is perfect for the aesthetic of the new film. The set comes with three mini-figs — Emmet, Wyldstyle in her new wasteland gear, and an Apocalyspeburg denizen with a great shark-toothed visor — but also Metalbeard’s disembodied head/beard, and the Heart and Star seen in the film. With a mini-launcher for gas canisters and a random on-fire oil barrel, the set has enough post-apocalyptic goodies for everyone.